I promised that I would have more to say about Nigel Slater’s Tender, my latest acquisition in the cookbook department, in the near future; and here is where I make good on that promise. This month is the fortieth Random Recipes challenge. In honour of the occasion, Dom requested that we count across our cookbook shelves until we reached forty, and then select our recipe from that book. Well, I know my cookbook shelf pretty thoroughly, and figured that Tender would be close to that vicinity. I hoped that I would land on it and get a chance to try my first recipe from it. I came awfully close. I ended up choosing my other Nigel Slater cookbook, The Kitchen Diaries (which sits right next to Tender) and the recipe for mint-cumin roast lamb. I was excited about making the recipe, since lamb is my favourite meat; and furthermore, the roast would need some kind of a side dish . . .
One from Tender, naturally! I have only managed to read a small sliver of the weighty tome so far (the final edit on my own cookbook has been occupying me almost constantly), but I had already bookmarked one recipe from the eggplant chapter: moutabal, a Lebanese puree of roasted eggplant with tahini, garlic, and lemon. 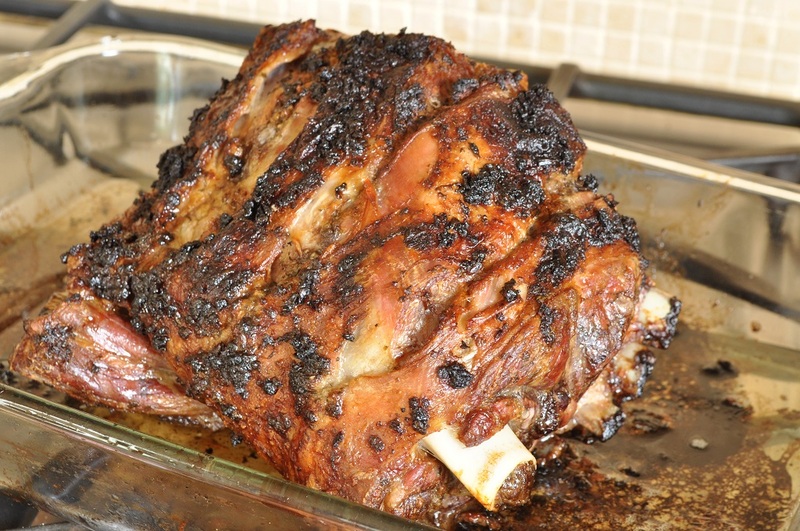 It would be the perfect accompaniment to the lamb, as the cumin and mint also have a vaguely Middle Eastern flair. Besides, it would be easy to slip the eggplant into the oven alongside the roasting lamb and cook them at the same time. Roasting is probably not the cooking method that we automatically turn to in the summer—unless it’s outside on a grill—but this lamb roast, with the freshness of mint and lemon, seems made for hot weather. The nutty, earthy moutabal contrasts beautifully with the bright flavours of the lamb, just as I had hoped it would. 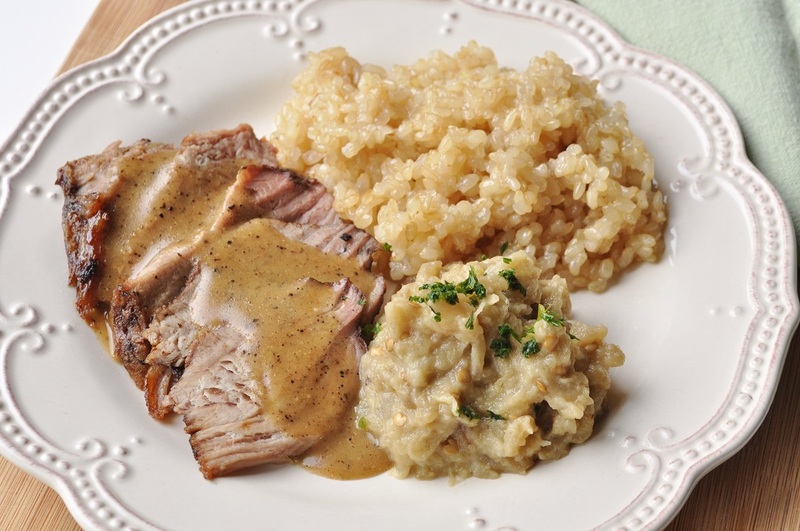 I also served a kamut pilaf alongside the lamb, and used up the last of a bottle of vidal blanc I had in the cupboard to make a gravy with the drippings from the roast. The meal was truly outstanding. Each component was delicious in its own right, but the greater pleasure was how neatly they all fit together and complemented one other. Cooking is sometimes like playing jigsaw puzzles, sliding ingredients around and putting them together in order to make a complete picture. This one is a masterpiece, I’d say. 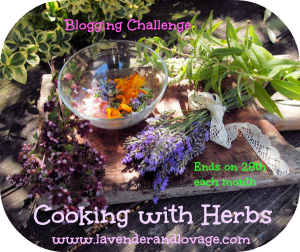 Besides linking up with Belleau Kitchen’s Random Recipes, I am also submitting this recipe to Lavender and Lovage’s Cooking With Herbs, which is being hosted by Linzi of Lancashire Food this month. Finally, I am linking up with Vanesther’s Spice Trail challenge over at Bangers and Mash. The theme for this month was cumin. With a sharp knife, score across the fat on top of the lamb shoulder several times, making sure to cut all the way through to the flesh. In a small bowl, whisk together the garlic, cumin, lemon juice, olive oil, chopped mint, salt, and pepper. Place the shoulder in a roasting pan and pour the marinade over it. Massage it over the entire joint of meat, making sure to rub some down into the cuts you have made. Let stand and marinate for up to an hour. Roast the meat to your preferred doneness. I always eat my meat well-done, and the roast took about 1 hour and 20 minutes to reach that temperature. 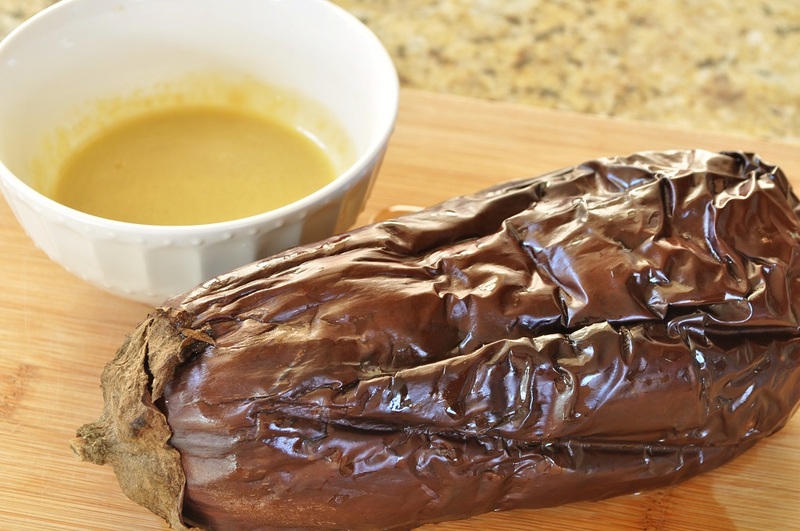 While the meat is roasting, you can also roast the eggplant for the moutabal. Make several deep cuts lengthwise around the eggplant and place it in the oven alongside the lamb. Roast until the skin is wrinkled and charred and the flesh is tender, about 1 hour. Remove the eggplant from the oven and let cool until you are able to handle it. 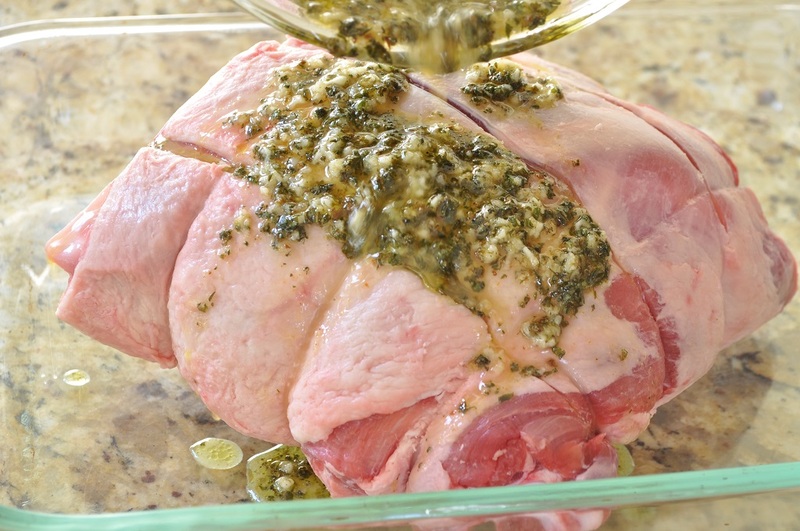 Transfer the roasted lamb to a platter and let rest at least 10 minutes. Strain off the fat from the roasting pan. Discard all but 3 tablespoons. Deglaze the hot pan with the white wine. Combine the reserved fat and the flour in a small saucepan over medium-high heat. Cook, stirring constantly, until the mixture is smooth and bubbly. Whisk in the white wine and continue to cook until the gravy has thickened. If necessary, adjust the consistency with a little water; season with salt and pepper. Keep warm. Cut the cooled eggplant in half and scrape out the flesh with a spoon. 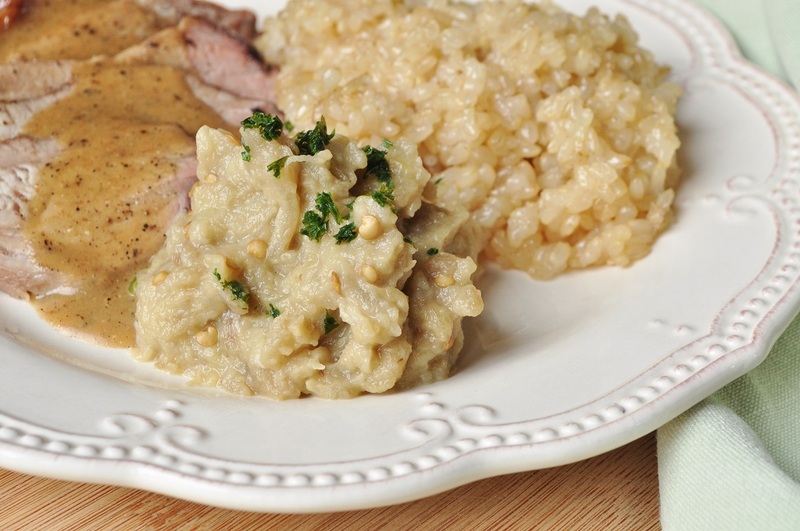 Place in a bowl and mash to a rough puree. Beat in the lemon juice, tahini, olive oil, garlic, and salt. 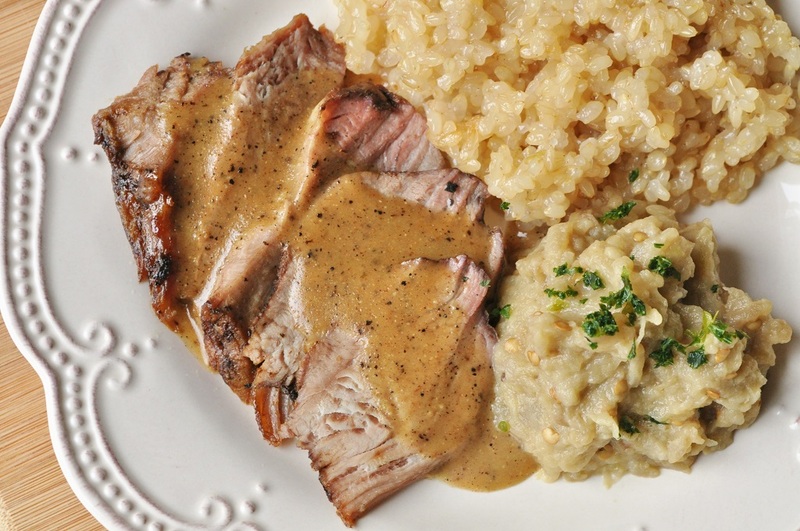 Slice the lamb and serve with the gravy and a large dollop of the moutabal. Most definitely a masterpiece. I’ve only just got out of bed but I could easily tuck into a plate of that and I’m drooling at the thought of that roast lamb! A wonderful entry for this month’s #TheSpiceTrail cumin challenge. Thank you so much for linking up. You know, I don’t think that I would have any difficulty eating cold roast lamb for breakfast, with sautéed tomatoes and an egg white omelet . . . in fact, it sounds quite good. That lamb looks wonderful. It is one of my favourite meats. The seasoning and spice sound perfect! I must try this one…..
Oh, I just love lamb! We don’t eat it nearly as much in the States as over in Britain–which I think is a terrible shame.